Sales Target Objectives | What's the REAL Purpose of Sales Targets? Home / Blog / Sales Target Objectives | Are You Getting the Most From Yours? Sales target objectives are the typical guide for making sure a business gets the turnover and profit margin it needs. If that’s the definition you’re using it’s not the worse definition. Using turnover and profit margin only is not a bad position to be in. But, whilst doing that, recognise that there are other levers sales target objectives you could be using to grow your business. If you stop thinking about sales target objectives as simply being financial drivers, and look at them in the wider context of behaviour changes that drive business growth and customer delight. Typically, sales target objectives definitions change depending on your perspective, are you the business owner, the sales director, the stakeholder, the bank, the sales person. That causes conflict and resentment in some cases. Clients might get burned in the pursuit of a fast money win for the business. Likewise sales teams might get set free to reduce head count, and make the books look good. What About Sales Target Objectives that Unite the Business? 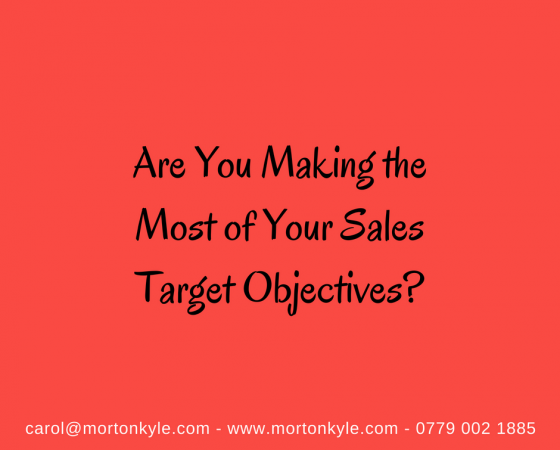 Here are some if the sales target objectives you could use, that are commonly used, in addition to turnover and profit, could you use these as well as financial targets? Client retention – how long are you keeping your clients or customers for? Sales velocity – how fast are your sales leads moving through the sales funnel? Repeat purchase frequency – how many times p.a. do your customers buy from you? Sticky customers – how many of your customers buy more than one line from you? Spend – how many of your customers are spending more than X? What’s your nett promoter score? How happy would your customers be to recommend you? What’s the trend, up, down, static? What’s the average order value? Is it going up, down, static? Highest Average Order Value is not always best, could be that you’re walking away from business you could afford to take, how about looking at an optimal average order value? What’s the sales teams close rate? Up, down, static? Percentage usage of sales appointments sat? A week is 100% and day is 20%, each day with three appointment slots is prime selling time. Each sales opportunity is 6.7% based on 5 selling days…what’s the selling percentage time used/not used? Cancellation rate of booked meetings? Money value of pipeline created/qualified per month? Sales forecast accuracy based on – financial accuracy, and deal origin accuracy? Lost sales percentage and analysis? These are just a few of the sales target objectives you can use to monitor progress, drive reward programs, celebrate success and enhance business performance. How many of these could you use? New customers brought on board? Lapsed customers reactivated in win-back campaigns? Highest level of data penetration in the sales pipeline? Most appointments booked in a day? Most orders generated per day/week? The more you review key elements of your sales process, and your sales metrics, the more you’ll see where the opportunity to set business changing sales target objectives that are easy to monitor and measure and also easy to use to motivate the team and grow the business. The more sales target objectives you use the closer you get to analysing sales excellence, understanding where the sales leaks are and devising ways to replicate good sales practice across the sales function and the business. Refusing to use a mixed bag of sales target objectives is missing out on the opportunity to reward, celebrate, learn and improve. Morton Kyle run a number of sales workshops and sales coaching modules based on sales targets and how to hit them, you can contact me for detail at carol@mortonkyle.com or you can call 0779 002 1885…alternatively you can check out some of our sales coaching or sales audit services. We also run and open and bespoke sales and business development course – The Sales Improvement Workshop if you’re looking for a whirlwind injection of sales skills, sales motivation and boost to your sales activities. Sales target objectives are how we keep score, it’s how our clients learn, how they discover what they need to do more of and what they can afford to drop altogether, so if you’re looking for work sales smart, let’s chat. Let’s get sales target objectives working for you. This entry was posted in Blog, Sales Audit, Sales Consultancy, Sales Strategy, Sales Training and tagged Sales Coaching, Sales Growth, Sales Metrics, Sales Process Design, Sales Target Objectives, Sales Training. Bookmark the permalink.